Congratulations to Tim Dawson of Indianapolis, Ind., our weekly, randomly selected DCI.now prizewinner from the week of Wednesday, May 24! 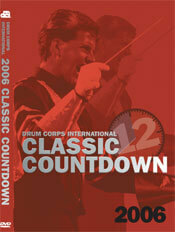 Dawson receives the 2006 DCI Classic Countdown DVD. "This is great! I have a friend on that DVD and he will truly enjoy this copy!" says Dawson.